This comes to B&B from Contributor Niamh who lives in Northern Ireland. Here at B&B, the default reviewer is Kristen, so if anyone else contributes we’ll make sure to let you know! If you’re interested in reviewing anything, drop us a line at beveragesandbooks@gmail.com. It is a truth universally acknowledged that I am unable to go the supermarket without at least perusing the book section. More often than not, perusing leads to purchasing and with my summer holiday fast approaching, I was in desperate need of a book that would transport me into the life of a sassy heroine. So in other words, I needed a book TARDIS. Enter Always The Bridesmaid. I’ve long been a fan of Lindsey Kelk’s work. I gobbled up her ‘I Heart…’ series and her ‘Girl’ series is going the same way. I love how when her damsels get into distress, they always get their damn selves out of it with sparkling wit and style. This book follows Maddie, a thirtysomething events planner who is trying to juggle a demonic boss; a friend in marital trouble, and her newly engaged bridezilla bestie, Lauren. There’s also a rather satisfying man dilemma sandwiched in the middle for good measure. Maddie gets herself in a few pickles, the most hilarious of which involves some rabbits dyed pink and an illicit cigarette. You’re intrigued, right? The book is lighthearted and frothy, but I don’t want that to be taken as some sort of underhand criticism. After a stressful year and having my head buried in more university textbooks than I care to remember, this book was the perfect escape. 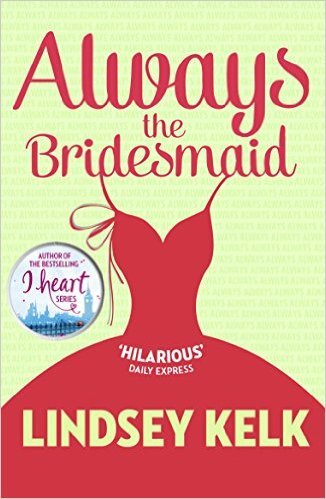 It made me laugh out loud, which is a feat for any written text, and, in typical Kelk style, Lindsey writes characters that so many women can identify with. I felt every inch of Maddie’s angst at the ridiculous (but oh so common) ‘who should sent the first post-date text’ dilemma, and understood her frustrations from trying to be all things to all men and spreading herself too thin. From Niamh: I bought this book with my own money; all opinions are simply my own rambling thoughts.